Last week I took a trip down south to visit friends in Chippenham. I took the opportunity to visit Waitrose (the nearest to me is in Edinburgh so I don’t get to visit very often) and came across Bear Granola Nibbles. One bag of Bear Granola Nibbles counts as one portion of your daily wholegrains, is high in fibre and contains around 99 calories depending on the variety. Best of all, they are wheat free, dairy free and sugar free and contain no preservatives, sulphites or gumming agents. So far, I have tried the Cherry Cocoa Pie variety which contain oats, maize, cherry pieces (cherry and apple puree), coconut, nibbed cocoa beans and grape, apple & carob extract. They are a great crunchy, chocolaty snack that kept me going between meals – and I especially loved the cherry pieces! As well as the Bear Granola Nibbles Bear make a whole range of different healthy snacks including two other varieties of granola nibbles (Apple Crumble & Tropical Crunch), fruit nibbles and fruit yo-yos and I’m looking forward to checking them all out! Hi, I love the Bear Nibbles Granola, but they’ve discontinued them for the time being. Does anyone have any idea who else is doing such a healthy granola as Bear Nibbles was doing, ie low in sugar and fat, and completely natural? 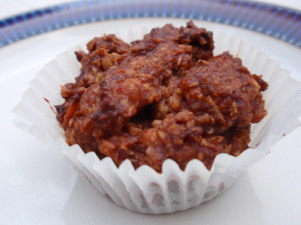 I am intolerant to wheat and eggs, so it can be tricky to find snacks and treats that I can safely eat. 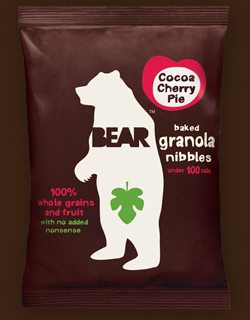 Bear granola nibbles are definitely a favourite, but they have off the market for months now. The company has advertised that a new flavour is to be released , but there seems to be no progress with this. Can anyone advise on when this product will be available?